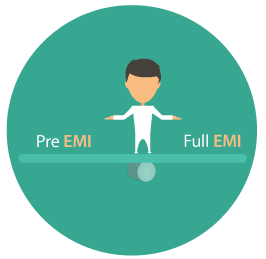 Full EMI- We pay the full EMI right after the first disbursement. We pay the EMI as per the sanctioned amount and not the disbursed amount. For instance, we have sanctioned limit of Rs 50 lacs. We have taken a loan for an under-construction property. We have taken disbursement for first tranche of Rs 5 lacs. Even though the disbursement amount is only Rs 5 lacs, you pay EMI based on entire Rs 50 lacs. At 10% for a loan of Rs 50 lacs for 20 years, the full EMI will be Rs 48,251. So, we pay this amount even though the disbursement is only Rs 5 lacs. We can opt for Full EMI (calculated using loan emi calculator) even for under-construction properties. Pre EMI- This is only applicable for under-construction properties. As long as the entire home loan amount is not disbursed, you pay only the interest on disbursed amount. There is no principal repayment till such time. Once the entire loan amount has been disbursed, we pay as per regular amortization schedule. In a few cases, the bank may have time limit for Pre-EMIs. i.e., we can pay Pre-EMI up to a maximum of say, three years. Subsequently, full EMI will start. In either case we can use loan emi calculator to find out the value of emi. For example, Nashik-based Sirish Lokhande, 43, is planning to buy a house, but is facing a serious dilemma. He wants to take a loan for a house that is still under construction and is unsure about the repayment schedule to opt for. Lokhande has two options. He can either opt to pay full, equated monthly installments (EMI) or pre-EMIs. In the first option, the amount he pays each month will be calculated on the basis of the total loan amount, while according to the second option, he would have to pay only the interest on the loan that will be disbursed at each stage of construction. The real EMI payment (calculated using loan emi calculator) will start after he gets possession of the house. On the face of it, the second option looks more lucrative since Lokhande has to pay only the interest component for the first three years, which would be a lot less than paying the full EMI. However, tax experts are of a different opinion. Amarpal S Chadha, tax partner, Ernst & Young says opting for the full EMI payment is more beneficial in the long run as we start repaying the principal amount from the first day. “This reduces the outstanding principal amount before we get the possession,” he says. In the case of the pre-EMI option, we will pay only the interest component till we get possession. Assuming that the developer takes three years to hand over the house and the loan tenure is 20 years, we will actually make payouts for 23 years. If we pay the complete EMIs, the payout will be for a lesser duration as the decrease in the principal component will translate into shorter loan tenure. Under the full EMI scheme, payouts are computed on the total amount. If the loan is 10 lakh, EMI comes to 10,152. In the pre-EMI option, the loan payouts are calculated (using loan emi calculator) only on the basis of the actual loan disbursement. For instance, if we have applied for a 10 lakh loan and the bank has disbursed 3 lakh, we will only have to pay the interest component on the latter amount, which comes to 2,687.50. I personally prefer Full EMI as we repay principal from the very beginning and thus the loan gets repaid faster. And we pay lesser absolute interest cost. In case of delays in possession, we may have to keep paying Pre-EMI for an even longer duration. This brings to an even important decision about whether we want to go for an under-construction property. But this is an altogether different discussion. However, do consider affordability of Full EMI. If a person can’t afford Full EMI (along with rent), then he should go for Pre-EMI.